If the plans concerning EMU will be realised, by 2002 national currencies will be replaced by the Euro and national central banks will be partially replaced by the European Central Bank. 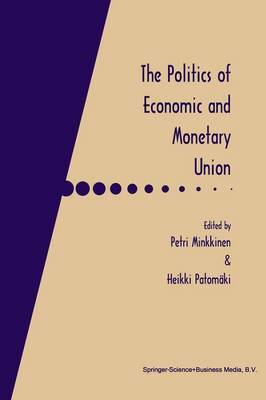 The Politics of Economic and Monetary Union starts with the argument that EMU is more a political than an economic project. It develops this theme by addressing five different questions. First, precisely what is the general role of EMU in the globalising political economy? Second, how EMU will change the power relations and the relationship between `political' and `economic'? Third, what effects will EMU have on generally accepted values - including for example efficiency, self-determination, and democracy? Fourth, how does the EMU-related politics of symbols - including money - take part in constructing political identities? And last, but certainly not least, what effects EMU will have on the social and political dimension of the Union and thus also on its legitimacy? The politics of EMU includes many dimensions. The book tries to explain the hegemony of the neoliberal and German vision of Europe in the context of recent development in the global political economy. It assesses the consequences of this hegemony and the possibility for alternatives from a variety of perspectives. In many chapters, it is also argued that the legitimation problems of the Union may turn into an acute crisis also because of EMU. We should expect an actualised crisis to lead to a transformation of the Union.